Fleming 55s have long been on my list of favorite cruising boats, and I see them in many popular cruising areas I visit. The couples who own them enjoy this lifestyle at a decidedly high level, with quality equipment, great accommodations, and the lasting beauty of the boat’s traditional lines. Tony Fleming, builder of the line of yachts ranging from 55 feet up to 75 feet, has long maintained that his boats are not trawlers, but cruising motoryachts. 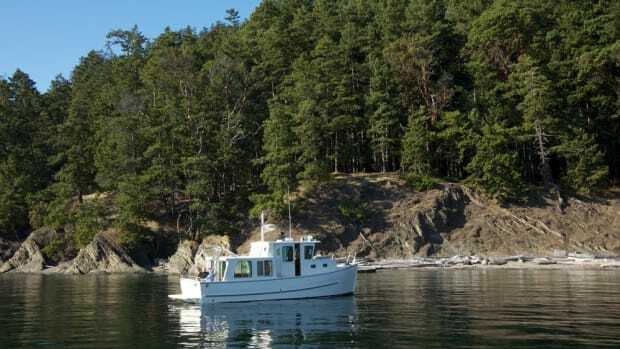 I won’t argue the distinction, but the Fleming 55 is every bit a cruising boat, a seaworthy vessel meant to range far and wide in comfort, safety, and luxury. One thing I’ve noticed over the years is how Tony keeps evolving the fundamental boat. Today’s Fleming 55 looks the same as one that is 10 years old—at least from a distance. Remarkably, the boats, while appearing similar, are very different from each other and reflect the builder’s obsession with perfection. Even equipment or systems that have worked well over the years get replaced when new products make the boat better, more comfortable, more quiet, or safer. To explore this evolution in depth, I spent some time with the folks at Burr Yacht Sales in Edgewater, Maryland, the largest dealer for the Fleming line in this country. The relationship between Tony Fleming and Arthur Burr goes back to 1990, when Burr looked to add a cruising boat to his business. The two men think alike, according to Ray Currey, who runs Burr Yachts today with a seasoned crew of professionals personally trained by Art Burr to create dreams for people while providing customer service that is second to none. It is a successful and impressive match of philosophy, style, and vision. Fleming Yachts builds about 10 boats a year, and, on average, there are 8–10 changes made in each boat. So in the span of three years, for example, there are 30 boats built, reflecting about 300 changes. Some are major, some are not, and maybe half can be retrofitted to earlier boats. Unlike other builders who follow a calendar year for modifications, Fleming’s changes just flow, and the boats get better one hull at a time. Some of these modifications come from Tony; some come from dealers; others are suggested by owners. It is a steady flow of input, and the product keeps evolving. That also explains why 26 owners have owned more than one Fleming, and why some have owned three. Let’s take a look at some of the major improvements that have come aboard the Fleming 55 in the years that Fleming and Burr have been working together, and highlight key milestones of the boat’s continued evolution. It is a great story, reflecting the influence Art Burr brought to the mix with his extensive motoryacht experience, as well as a background that includes working with Admiral Rickover’s naval nuclear submarine program. I had the opportunity to tour hull no. 17 as an early example, and then went aboard the latest 55-footer being commissioned at Burr Yachts, hull no. 170. Wow. Similar yet different doesn’t begin to describe the vastly improved boat. As Ray Currey recalls, in 1990, the Burr team put together a “build list” of what it wanted in its first Fleming 55 (no. 29), which was to be Art Burr’s personal boat. Optional equipment was identified and made standard for all future boats coming to the Maryland facility. Air conditioning lines and systems were factory installed in all Burr-ordered boats, even if air conditioning remained an option in Europe and the Pacific Northwest until some years later. An entertainment center was ordered for the starboard side of the saloon, and wire runs were fitted to ease future installations of equipment. 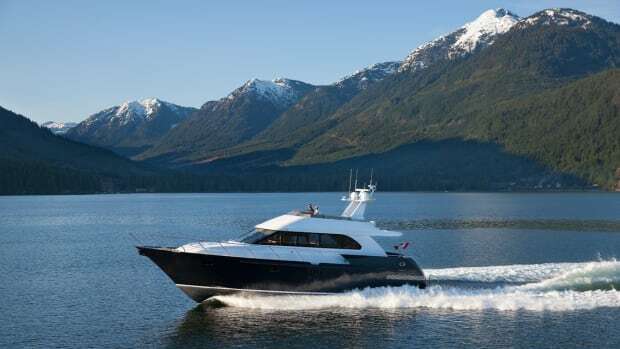 In essence, Burr Yachts put together a list of equipment that was more consistent with high-end motoryachts, such as a full-size refrigerator and freezer, to replace the typical marine AC/DC refrigeration units of the day. By hull no. 33, quartz lighting had replaced traditional 12VDC ceiling-mounted lighting. At the same time, side deck gates were changed to open into the side deck, rather than opening out, which solved many issues of cruising reality. The forward master stateroom was redesigned with that hull, providing two full hanging lockers and a set of drawers that somehow make the stateroom eappear even larger. Seeing an earlier boat proves what an enhancement that was. The Fleming 55 is a three-stateroom boat, with wide side decks and a large covered aft cockpit. Typical of Taiwan yacht building of the era, there was lots of exterior teak, including a teak-slotted swim platform. With hull no. 39, the platform was replaced with a fiberglass structure, a step that signified a shift away from maintenance-intensive teak. Stainless steel and fiberglass replaced teak in such areas as trim and exterior door frames. That process continues today, with an optional nonskid foredeck in lieu of the standard teak foredeck. With hull no. 43, the air conditioning compressors were moved from outboard and forward of the engines to the lazarette. This opened up the engine room and made room for a proper installation of the boat’s active fin stabilizers. It also made the air conditioning extremely serviceable in a cool location with great access. 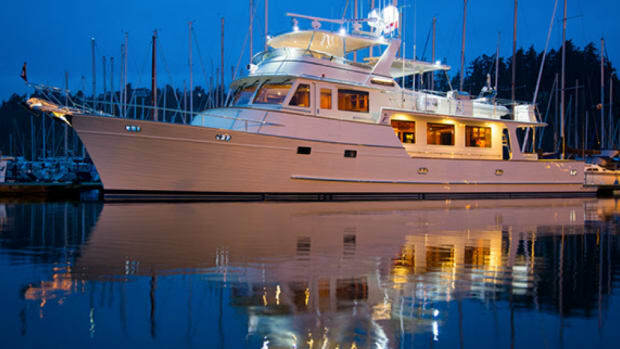 The Fleming pilothouse is one of my favorite command centers, roomy and elegant, and a joy to experience. The flybridge is good for running the boat in nice weather, but the pilothouse is king. The marine electronics explosion during the 1990s made us hunger for more electronics console real estate, especially with the introduction of large flat-panel displays. This was acknowledged on hull no. 44, in which the pilothouse console was redesigned to allow a better viewing angle for the new technology displays that were coming out by mid-’95. It made the pilothouse even better. The next big milestones showed up on hull no. 57. The 1,000-gallon steel fuel tanks were replaced with fiberglass tanks, removing the possibility of corrosion, rust, or broken welds. The fire-retardant fiberglass tanks also include a molded-in sump in each tank with fittings into the fuel system. On this same hull, Fleming introduced Portuguese bridge doors to allow getting on and off the boat in tidal situations where the side decks were too low to reach terra firma safely. West Coast boaters frequently find floating docks, but in cruising the East Coast from Nova Scotia to the Bahamas, boaters encounter much diversity in docking levels, and these bridge doors are a popular, if expensive, retrofit to older boats. The change in tank technology continued, and on hull no. 60, the stainless-steel water tanks were switched to polyethylene; there are now four easily removed water tanks instead of two large metal tanks. An easily accessed drain fitting was plumbed into the water system to bleed stale water out of the polyethylene tanks. Potable water drains into the bilge, exercises the bilge pumps and switches, and cleans the bilge at the same time. That’s a good idea for a large cruising boat that carries 300 gallons of water, and many Flemings are also equipped with a watermaker. On the very next boat, no. 61, Fleming raised quality up another notch. The boat got a 220VAC system to replace 110VAC service. This upgrade allows for a single shorepower cord, while providing juice for a 220-volt dryer and other appliances. The change was done without reducing the size of the boat’s wiring, so the safety factor was increased. In addition to the electrical upgrade, Whale pipefitting plumbing was installed for better locking and serviceable connectors throughout the boat’s water system. Around the same time period, larger marine electronic displays worked their way up to the flybridge, as Tony increased the size of the flybridge helm console to accommodate more electronics and newer, integrated engine gauges that took up less space. The changes in electricity continued, and by hull no. 70, the 12VDC system changed to 24VDC. This made for more efficient voltage with less amperage, as more equipment became available in 24 volts. The focus on flybridge utility continued to evolve in Tony’s mind, and he redesigned the flybridge console once again on the next hull (no. 71) to get it even better. Over the next series of boats, Fleming installed large fiberglass covers over the Aquadrive thrust bearings, which contribute to Fleming’s reputation for quiet, smooth operation. These covers offer secure seating for those who are servicing mechanical equipment and keep them safely away from large, turning driveline components with protruding bolts. In 1999, Fleming built hull no. 87: a significant milestone for the boat line. The entire boat deck structure was redesigned, with new helm console, helm chair bases, nonskid decking to replace teak, better roof drains, and a host of other improvements. It was a major upgrade that reflected lots of ideas and input from the Fleming community. Another huge change was in the engine room. The venerable Caterpillar 3208 diesel engines, no longer able to meet newer emissions standards, were retired. The engines proved very reliable, were serviceable anywhere in the world, and were popular with owners, but they became extinct as technology rose to meet the challenges of a cleaner world. The replacement choice was the Cummins 450hp diesel engine. The Cummins’ gear-driven power takeoff was perfect to power the hydraulics for the stabilizers and was compliant with emerging regulations. While figuring out the engine changes, Tony saw an opportunity to transform the engine room. His revised floorboards provided 8 inches of additional headroom, and the entry door from the lazarette was also made wider for better entry. I was fascinated as these details were explained in chronological order and as I witnessed the evolution on 55-footers of various vintage at Burr’s facility. On hull no. 90, the showers became molded fiberglass units, eliminating seams and making them easier to keep clean. This boat also got a hatch treatment that came from Tony’s efforts on his new Fleming 75. He drew that larger sistership’s hatches with rounded corners, and the euphony of that design style was quickly incorporated in his other boats, so no. 90 has lovely rounded corners on all her exterior hatches. The squared-off hatches of earlier boats look positively antique by comparison. While thinking about hatch improvements, he replaced the two engine room hatches in the saloon with three hatches that give a couple of inches of added headroom between the engines by moving the hatch beam supports. Fleming also recessed side-deck cleats into bulwarks, so you can’t walk into them. They also look great. Interior appointments were next on the list, so with hull no. 112, all interior cabinets were crafted with raised panels rather than flat doors. The look adds a touch of elegance in an interior that is already so. Hull no. 112 also got the first electronic engine controls. In 2002, engine technology made big steps forward into the electronic age. The Cummins engines were upgraded on hull no. 125 to its new electronic engines, rated at 480hp. Along with that change came Tony’s second-generation generator muffler design, which separates exhaust gases out the transom. Patrick was particularly excited to mention hull no. 132, which got a hugely improved inverter and backup electrical system using the latest in charger technology. Each engine drives a 110-amp, 24-volt Leece Neville alternator, and both can simultaneously or independently charge the batteries, connected through a Balmar multi-stage regulator. In terms of electrical systems, this redundancy and level of automatic control for charging the ship’s systems was particularly interesting to Patrick, the fellow in charge of making all of Burr Yachts’ Flemings as reliable as possible, as automated as possible. The Fleming molds were getting tired by this point, so a new set of molds was created to build hull no. 136. Interestingly, Tony had the chance to change the hull shape as he saw fit, but he opted to change very little—a testament to his original design work. What worked stayed put. The little things continued to go aboard as ideas were turned into reality. Gas struts were installed on all hatches for hull no. 141, and on all boats since. On hull no. 157, Fleming gave the boat deck an extreme makeover for the third time, providing even more console space for instrumentation, adding 8 inches to the cockpit overhang, extending the cockpit hatch for better access, installing stronger tender mounts, and making a larger access hatch from the pilothouse. 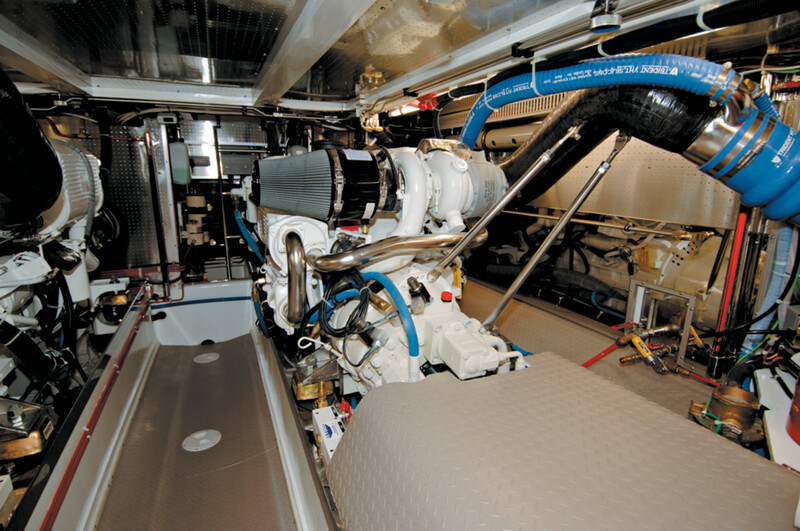 The next generation Cummins diesel, rated at 490hp, was installed on that boat, as diesel engine technology continued to march forward. Today, on hull no. 170, we found highly polished stainless-steel mirrors mounted on the inboard side of the fuel tanks, reflecting the outboard side of each engine. Nice touch for a quick peek at the other side of the engine. 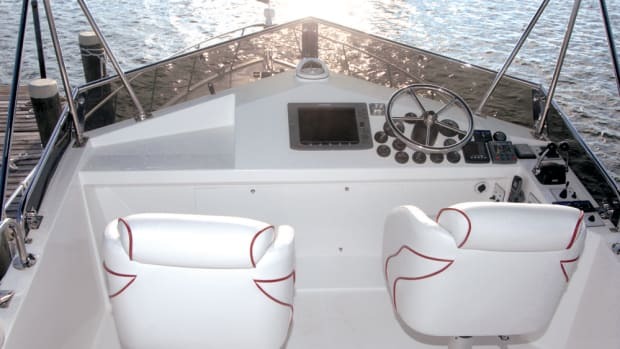 An aft control station was added on the aft end of the boat deck to allow precise boat control while docking, and this improvement is being retrofit to older boats as a popular solution for better boat handling. Ray also pointed out the new hydraulic booming and lufting davit that allows the operator to position the davit over the Nautica RIB tender and maneuver with complete control. The operator is no longer limited by a fixed-length davit boom or by balance issues. And speaking of Nautica, Patrick told me about something that is absolutely worth sharing. He told me he liked my article on the Florida-based RIB builder (PMM April ’06). Then he said that one of his owners was ready to buy a new Fleming and was preparing his older Fleming for sale. His aging Nautica had some issues with her hull fiberglass, so Patrick called Nautica’s Franco Rossi Jr. to see if this was an anomaly or simply old age. As Patrick tells the story, “Junior” asked if the owner could bring the tender to the Nautica facility near Ft. Lauderdale. As the owner was only a few hours away, he trailered the boat over to Nautica, and Junior took a look at the RIB. He then asked if the owner might leave the boat with him for four hours, to which the owner agreed. When the owner returned later in the day, Junior’s crew had removed his outboard and equipment off the old boat, and installed them on a brand new Nautica RIB. Junior handed him the keys to his new tender and thanked him. The owner was speechless. Patrick locked eyes with me with a suddenly serious expression, and simply stated, “What more do I need to know than that?” It was enough to win over Patrick, who continues to make Nautica the standard tender on all Flemings outfitted by Burr Yacht Sales. Junior speaks the same language as the Burr crew: a mantra of customer service above all else, and doing the best job possible. I asked Ray Currey if there was an end in sight, a point where no more changes would come, and he just laughed. It seems hull no. 173 is getting infinitely adjustable pilothouse doors, and there are more changes on the way that he knows will be a surprise to everyone. But that is the way it has been since the beginning, and everyone feels good about it. If you ever look seriously at the Fleming 55 as your ultimate cruising machine, pay no attention to model years, as they don’t really mean anything. Get two owners together, and they talk of hull numbers. It’s hard to tell them apart, but once you understand the evolution of this classy and classic yacht, a boat ready to cruise anywhere in safety and comfort, you’ll understand why it remains one of my very favorite trawlers...er, cruising motoryachts.